If you list fond memories from childhood, many people will recall sled riding. It might even be at the top of the list. Some of my favorite memories involve wiping out with my buddies. We’re likely to have a snowy winter in the Northeast, so expect many more great memories to be made. From 1997 to 2007, there were at least 229,023 emergency department visits by people 19 and younger. That’s about 23,000 injuries a year in the U.S. The most common injury involved fractures (26 percent). Half involved collisions of some sort. Of those children who are hospitalized, the most common body part to be injured was the head, at 30 percent of all injuries. And some of those injuries (10 percent) resulted in permanent disability. Boys get injured more than girls (59.8 percent of injuries). One third of injuries are related to a sled being dragged behind a vehicle. So sledding can be dangerous as well as fun. It’s great to get outside, have fun, and be active — but what can you do to keep it fun AND make it safer? Wear a helmet. Head injuries from sledding are very much like bike injuries. Helmets are 85 percent effective at preventing brain injuries while bike riding, so it stands to reason that it can prevent a tragedy while sledding. Make sure an adult is present to supervise and is available for first aid or assessing an emergency. Make sure the adults are sober. Alcohol impairs judgment. Avoid areas that have trees, roots, stumps and holes. Find out if a local hill is officially designated as a sledding spot. And if signs are posted forbidding sled riding, it is probably for a good reason. The City of Pittsburgh, for instance, posts signs warning residents not to sled ride in Frick Park (“Blue Slide Park”) off of Beechwood Blvd. It has many trees, is very steep, and ends with woods rather than evening out gently. Look for a long, wide, smooth, clear hill that evens out at the bottom with plenty of room. The bottom of the hill should not run into trees or a pond, street, or parking lot. Look for a slope that evens out so the ride will slowly peter out. Position children feet first, sitting up. Leading with the head is more dangerous to the head and eyes. Children younger than 6 years old should ride in the sled with an adult. Use a sled that is steerable. Inner tubes, discs and saucers are harder to control. Keep arms and legs inside the edge of the sled at all times. Artificial jumps increase the risk. Take turns going down the hill. A crowded hill is more dangerous. Use a real sled. Cafeteria trays and appliance-sized cardboard boxes are more likely to be pierced by rocks and stumps. They don’t handle rough ground as well as a sled. 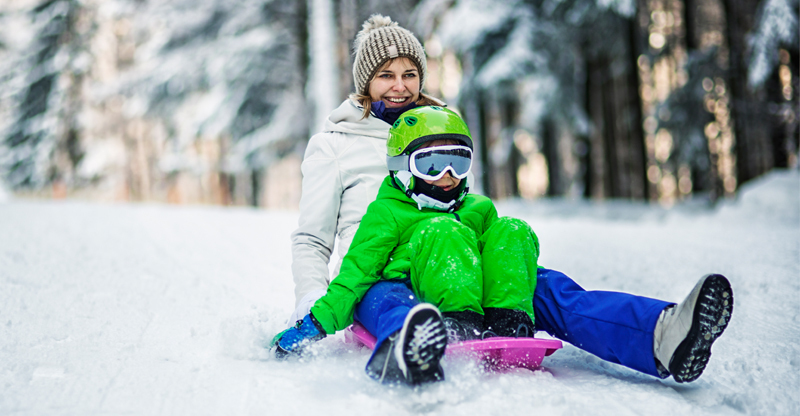 Teach young children to roll off a runaway sled, rather than lose control or collide with a tree or other sled-riders. Tell them not to worry about the sled. Let it go. Return trips up the hill should be off to the side. Leave the middle of the hill to the downhill trips. Stick with daylight, and quit at dusk. Do not drag sleds behind a vehicle, including ATVs and dirt bikes. As you see, sled riding has risks. But following safety guidelines can make it more fun and less likely to turn tragic.